Glyptostrobus is listed in Group I of the ‘Rare and Precious Flora and Fauna of Vietnam’ (Council of Ministers Decree 18/1992/HDBT)12. Under this legislation reserves and management plans had to be established. Exploitation and use are forbidden. Further legal protection was given under Law on Environmental Protection13 that was aimed at regulating developments in the surrounding areas. The Dac Lac Provincial People’s Committee declared reserves for both populations in 1994. Management boards and management plans along with guard stations and fences were established (Tordoff et al., 2004). Globally, this species is listed as Data Deficient due to uncertainty about the natural status of the Chinese populations. Recently, and partly as a result of the clarification of its status in Vietnam it has been assessed as Endangered following criteria B1ab(i, iv) and B2ab(i, iv), D under the IUCN (2001) criteria (Farjon et al., 2004b). In Vietnam, Glyptostrobus should be listed as Critically Endangered under categories A2c, B1ab(i-v), B2ab(i-v) and C1 (see Annex 1 for explanation of IUCN, 2001 criteria). The extent of occurrence and the area of occupancy are considerably less than 100 km2 and 10 km2 respectively. The two extant populations remaining in Vietnam can be regarded as severely fragmented and, based on the current observed health of the trees in both populations and the types of threats described above, there will be a ontinuing decline in the area, extent and quality of habitat. The overall Vietnamese population contains less than 250 mature individuals and, with the level of damage caused by recent fires and the likelihood that they will reoccur, a further decline of 25 % within the next generation would be a reasonable estimate. 1, 3. 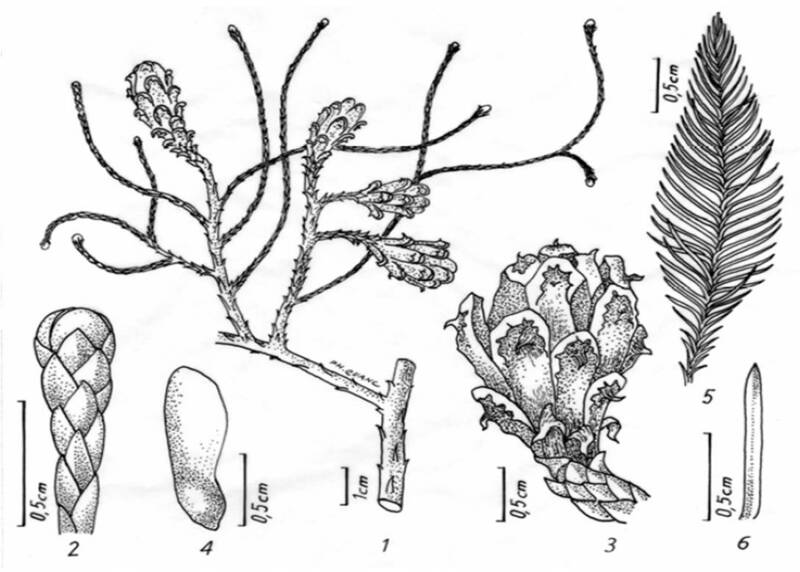 Cone-bearing branchlet and seed cones. 2. Branchlet with adult leaves. 5-6. Juvenile branchlet and juvenile leaf. (1-4 drawn from Thien Can & Minh Tuan T031-7095 & Vu Van Can s.n., 5-6- from Vu Van Can s.n. by Pham Van Quang). An upright tree with a pyramidal crown becoming broader with age, smallest branches usually deciduous, reaching up to 20 m high with a dbh to 1 m. Pneumatophores often found around the partly buttressed base of the tree. It is found in closed evergreen swamp forests dominated by Syzygium, Dipterocarpus obtusifolius and Elaeocarpus (mean annual temperature 22-240C, annual rainfall 1300-1800 mm) on a basalt substrate from 550 – 750 m amsl. No other conifers are indigenous to this area. Natural regeneration has not been reported. In Vietnam it is only known from Dac Lac (Ea H'leo, Krong Nang). 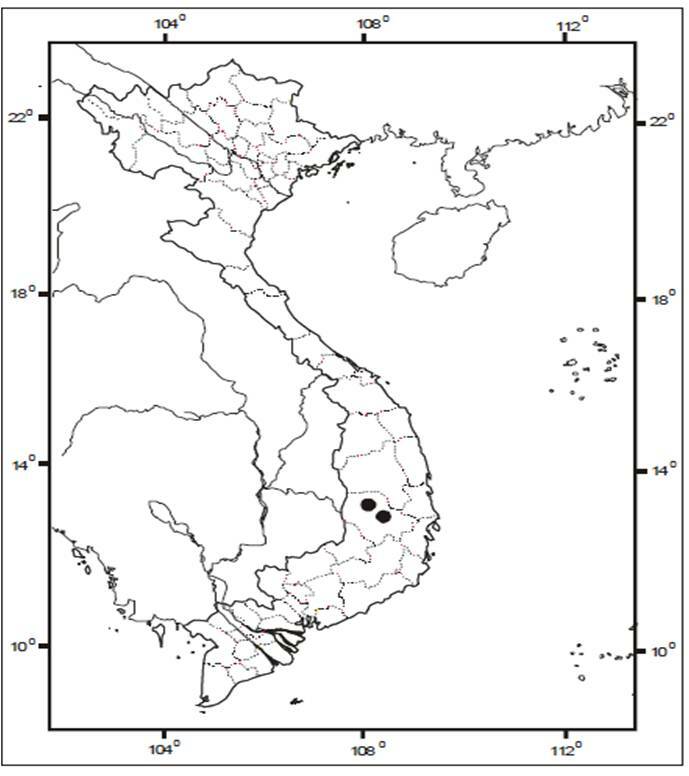 It may have been more widespread in the past, at least in Gia Lai and Lam Dong. Most records from south-east China refer to cultivated or naturalised trees but there may be several areas in which original populations or remnants of populations also occur. This situation makes is currently very difficult to evaluate the IUCN status of this species on a global scale. Reports of its occurrence in Khammouan province in Laos are based on verbal reports by visiting Vietnamese foresters (Thomas et al., 2004d). Previously used for construction and craftwork. In China, timber from naturally fallen trees is used for boat building and bridge construction as it is water resistant. It has a very attractive habit and is suitable for planting near water. In China it is often planted on flood banks for stabilisation (Fu Li-kuo et al., 1999d). In Vietnam, Glyptostrobus is confined to two small nature reserves surrounded by coffee plantations. Its extent of occurrence and area of occupancy are considerably less than 100 km2 and 10 km2 respectively. The estimated total population contains less than 250 mature individuals. Both populations are declining and face considerable threats from fires and habitat changes, primarily conversion to agriculture. The largest population, (c. 220 trees) is located in a small 50 ha reserve at Earal while the second, (c. 34 individuals) is within a larger reserve (100 ha) at Trap Kso. 13 Government Decree 175/1994/CP, dated 18/10/1994 on Guiding the Implementation for the Environmental Protection Law. The area covered by the reserves and the size of the populations within them is too small toguard against stochastic events such as fire over the longer term. Due to the extensive clearance of the surrounding areas there is no possibility of linking the reserves to other suitable areas. Despite these problems, the efforts at in situ conservation should be maintained, not least because the swamp community (particularly at Earal) may represent assemblages that no longer occur anywhere else. A full survey of both reserves is needed before this potential benefit can be assessed. The critical state of the remaining trees makes some form of ex situ conservation essential. The Forest Science Institute of Vietnam has been attempting to establish an ex situ collection for a number of years. Seed collections have been made repeatedly but no germination has been recorded. Attempts at vegetative propagation by FSIV have also been largely unsuccessful, probably due to the senescent state of most of the trees and the consequent lack of suitable propagating material. A limited number of clones have been successfully rooted and are being grown on at the FSIV research centre in Dalat. If these clones can be established, then other techniques could be used to produce material for ex situ work. At the RBGE the use of cone induction techniques have successfully produced viable seed from this species. Tissue culture is another potential option (Thomas et al., 2004d). Source: Nguyen Tien Hiep, Phan Ke Loc, Nguyen Duc To Luu, Philip Ian Thomas, Aljos Farjon, Leonid Averyanov and Jacinto Regalado Jr. "Vietnam Conifers, Conservation satus review 2004"
® BVNGroup. All reused content must be quoted as abstracted from this website.